Today is my Michael's birthday!! It's the day my favorite boy came into this world so that I could then be born 3 years later and then 19 years after that I could fall in love with him and then 4 years after that we could get engaged and less than a year from now we can get married <3 Happy birthday sweetie, I love you more than anything! And he and I loved these cookies almost that much. Which is like...a lot. And Zulka just came out with some new sugars, and I was able to try their Brown Pure Cane Sugar and Powdered Pure Cane Sugar! Powdered sugar is great and all but....brown sugar is where it's at. It's my boo. My sugar BFF. 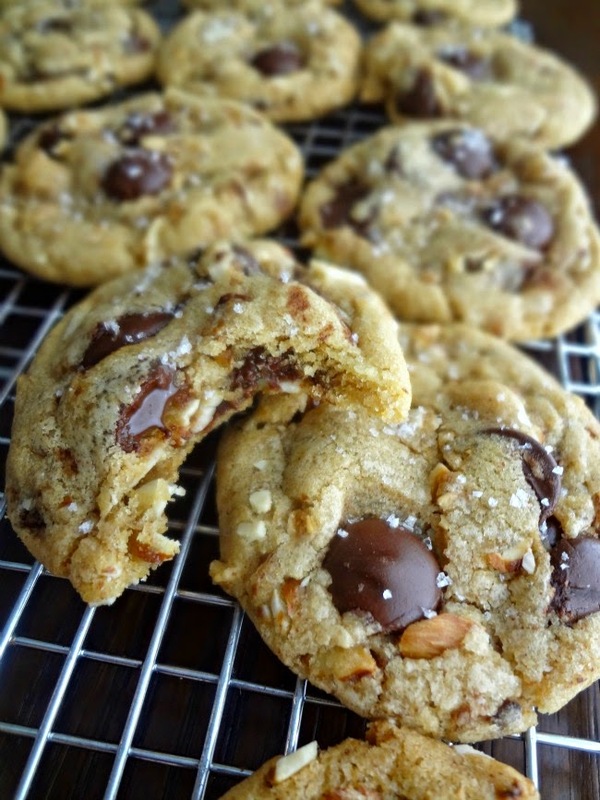 So when I tested it out I wanted to make sure I chose a recipe that was really going to showcase it, as well as show me how it would behave in my favorite use for brown sugar: chocolate chip cookies. 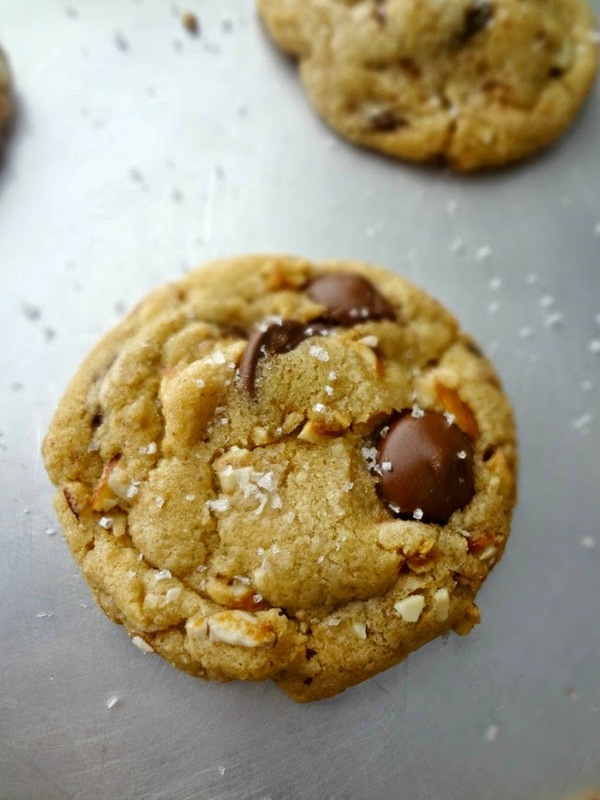 This recipe was perfect because not only is there a big dose of brown sugar in the cookie dough, the almonds are also toasted and caramelized in brown sugar-double whammy! And btw-the sugar was phenomenal. Subtly more rich and flavorful than more processed brown sugars, it really took these cookies to the next level! Browned butter and brown pure cane sugar lend these cookies complexity and warm, delightfully comforting flavors. Brown sugar candied almond slivers add some smokiness and crunch. Dark chocolate is the bite that cuts the sweetness, and then the sea salt just ties everything together into a neat, delicious, cookie bow. 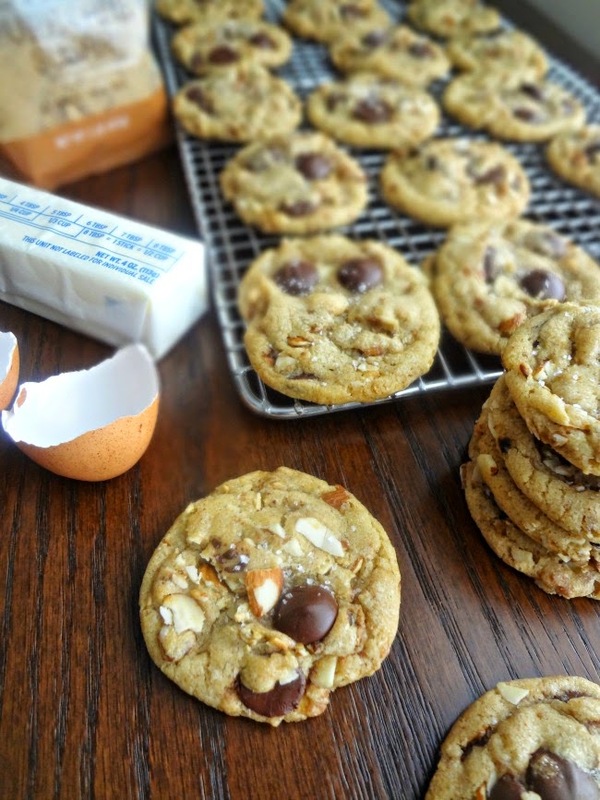 As my fiance' and I were hunched over the cookie jar, shoveling fresh cookies into our mouths, Michael declared (around a mouthful of chocolate and almonds and cookies), "These are some of the best cookies you've ever made." "Really?" I declared, probably causing bits of cookie goodness to escape and fly into his face, "EVER?!" "They're up there," he confirmed, before reaching for another cookie. You'd reach for another cookie too. Makes 24-45 cookies (depending on size). Place almonds and 1 tsp. butter in a large pan/skillet and cook over medium heat, stirring as they become heated and begin to toast. After a few minutes sprinkle with 3-4 tbsp. brown sugar and, continuously stirring, reduce heat to medium-low. The sugar will melt and caramelize and the almonds will turn golden brown-remove from heat to avoid burning. Sprinkle with 1 tsp. sea salt (or kosher salt) and spread out on parchment paper to cool (clumps of almonds are fine). To brown the butter: In a (preferably light colored) saucepan melt butter over medium heat, whisking constantly, as it foams and bubbles and eventually little brown bits form and it turns amber (this will take a few minutes.) Immediately pour into a large, heatproof, bowl. Let cool for 5 minutes. While the browned butter cool, whisk together the flour, baking soda, and salt in a medium bowl. Add the brown and granulated sugars to the cooled brown butter and beat with an electric mixer until combined and a bit lightened in color (about 1 minute). Beat in the vanilla, egg, yolk, and milk. Slowly add the dry ingredients in and mix on low until fully incorporated. 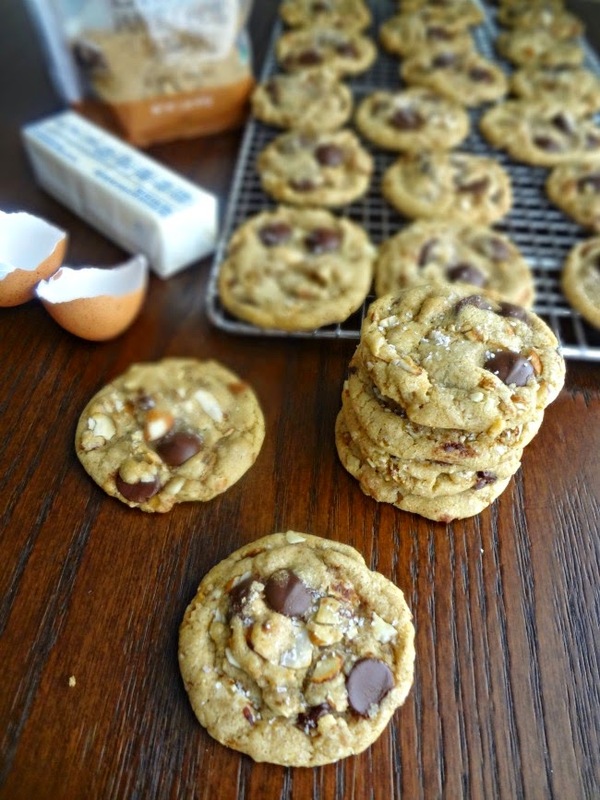 Fold in the chocolate chips and brown sugar almonds-may need to use your hands to evenly distribute into the dough. Cover with plastic wrap and place in the refrigerator to chill for 2 hours. Preheat oven to 325F degrees. Prepare a large cookie sheet with non-stick cooking spray, parchment paper, or silicone baking mat. Measure about 1 and 1/2 tbsp. of chilled dough into balls (using a cookie scoop or just measuring out and then rolling). Place dough balls on prepared baking sheet, about 2 inches apart, and slightly flatten the top of each dough ball (I ended up needing to do 3 batches to bake all the cookies). Bake 10-13 minutes, until the edges of the cookies are starting to turn golden (middles may look a bit underdone, this is fine!) Cool cookies on baking sheet for 2 minutes. Sprinkle with sea or kosher salt. Transfer to a wire rack to finish cooling. Repeat until all the cookies are baked. Enjoy! Store leftover cookies in an airtight container at room temperature for up to 1 week (best within the first couple days) or store in the freezer for a couple months. I just want to rewind to having this baking sheet of freshly baked cookies in front of me, and devour the whole thing. #regrets. Disclaimer-I was provided with samples of Zulka sugar to review. All opinions are my own.